Reading Rainbow DVDs teach important life lessons around families, values, and new experiences. Always My Dad is about a girl whose parents are divorced and hardly sees her father. She thinks about him often and treasures the time she has with him. Reading Rainbow episode’s host, LeVar, joins a Family Day picnic and shares how he grew up in a single parent family. Viewers meet a one parent family, and see how these four children and father manage schedules, responsibilities and share lots of love. A boy who rarely hears from his father tells how the "Big Brother, Big Sister" program paired him with a special friend. This episode explores a delicate family issue in a positive way. 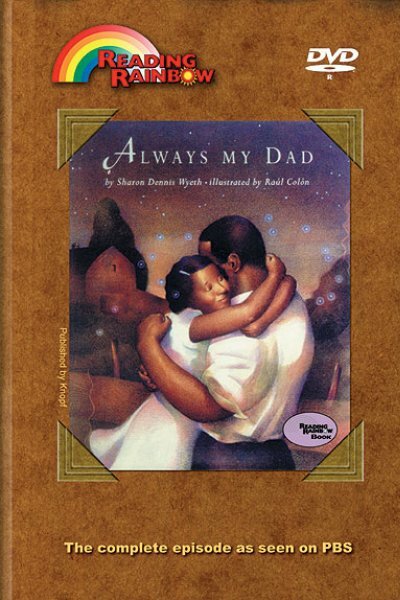 You can purchase Reading Rainbow episodes like Always My Dad by adding it your cart right from this page. Also browse other Reading Rainbow DVDs for more family oriented stories. Click here for Theme Lesson Plan -- "Families"